I live under the Eglin AFB flight path and not too far from a Navy EOD school. Under most circumstances, the Department of Defense is pretty good at only blowing stuff up during normal business hours. The only really freaky event is when they decide that 2:00am is the right time to relocate all the planes on base ahead of a possible hurricane strike. The F-35s are quite lout then. I have no idea why so much time and money was spent making the F-35 “stealthy” because it’s so darn loud that you don’t need a radar to detect it. You’ll be able to hear it. The F-35s are quite lout then. I've learned a new word today! an uncouth and aggressive man or boy. "a crowd of drunken louts"
We used to live a few miles from Langley AFB. I loved the jet noise. It's official: as of earlier this morning, we've had twenty inches of snow at MSP this month, and it's only February 12th. This makes it the fourth snowiest February in history and likely to move up the list and maybe make a new record during the next two weeks. ADDED: We apparently made #4 in the recordbook at 6 am, and it's snowed an additional inch or two since then. I blame it on global warming. If you've ever met fighter pilots, sounds like that definition of "lout" is fitting and applicable. They fly over my house frequently, but I don't usually get to meet them. 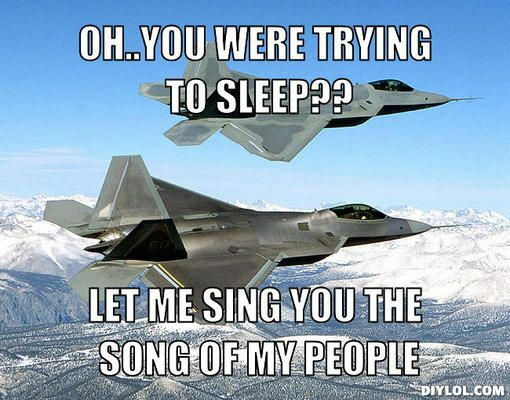 It's probably a good thing you don't get to meet them when they are flying over your house. Yeah, the alternative would seem to be that there's an emergency landing in your yard, which would not be good for anyone. Well if the pilots ejects and lands in his yard, chances are the plane landed in someone else’s yard.